OK just before I added a link to press publish I noticed that there’s a completely ad free version of this app that is still free and has some subtle improvements. These are in blue. Note the video is of the older version. It’s really beautiful. The coins are realistic and spin about completely in 3D and land like a real coin (sometimes falling on the side if it’s against the edge or you’ve just managed to balance it perfectly). Watch the video because it’s hard to see it in stills. Friends I’ve showed it to didn’t know what to think of it until they started playing with it and just kept flicking and tossing the coin much longer than I thought they would. You can change the type of coin from US cent, British Pound, Euros from France, Germany, Italy, Spain and the New Zealand Dollar. The background can be changed to various different things, paper, wood, stone, chess board, electricity, mirror and money. Finally the camera can be changed so it can view above, side or follow. Sound effects accompany the coin…you’ve got that shrill of the typical spinning flipping coin or the chink of change as it lands. 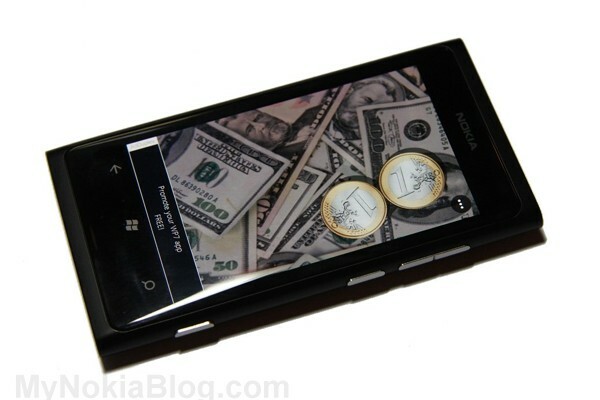 The start up of the + version is nicer, it zooms in to the coin. It’s a really simple app to use and straight forward. The menu is simple although perhaps could be made easier to press? 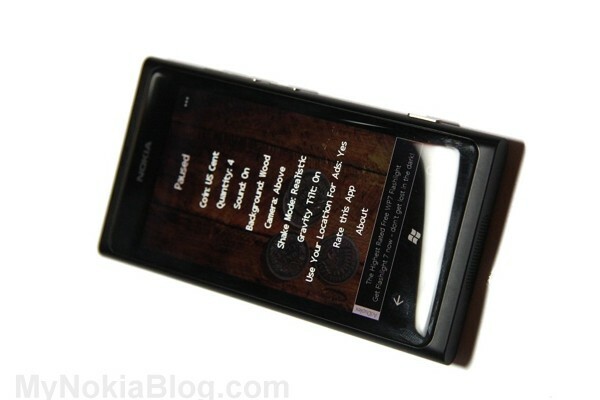 Additional features include being able to change the gravity tilt so it uses the accelerometer. 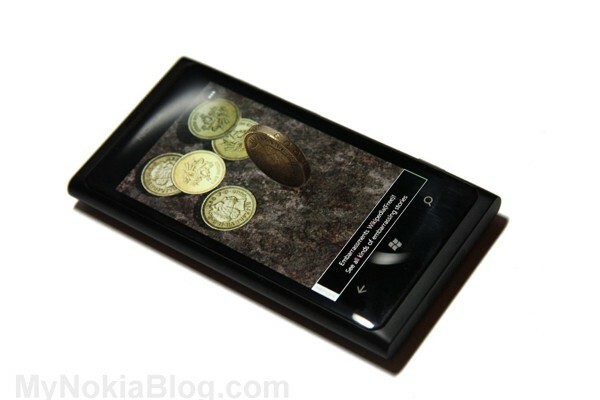 This way you can roll the coin around or make it land in different areas depending on where you were tilting the phone. 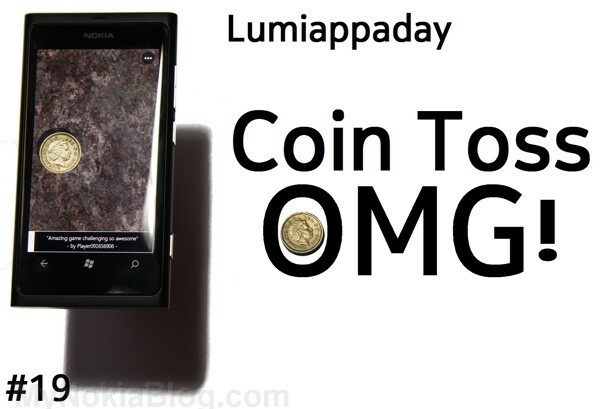 You can also change the shake feature so it either automatically flips when motion is recognized or realistic so the coin will move around like a real coin might if it were stuck inside a Lumia shaped box. I’m updating this post already as the app I filmed actually has a better version without ads, and there’s a quick button to change views. When you press it, you can see the camera pan down for the top or side views. In the + version you can also change gravity strength from low, normal or zero. Yeah it just works. Fast and stable. The accelerometer is really quick so it slides around as expected. With 1 coin or up to 5 coins the app is still as responsive. I guess the only thing I would want is improved sound so it’s much more reactive to the movement. It’s free with ads. You get the option to allow GPS to serve you locally relevant apps. Oddly just checking for the link in market place, there’s a free version without ads. Will have to update stuff (in blue). The next apps this week are a little more ‘functional’. Download the + Version. Polished job.